Today is Earth Day, but this year the usual corporate greenwashing and symbolic gestures aren’t going to cut it. This year, we’re taking it back. Students on dozens of campuses are organizing Take Back Earth Day events to demand their colleges and universities address the climate crisis with more than just words. At the same time, a movement-wide coalition is pushing on the national level by flooding the State Department with over 1 million public comments against the disastrous Keystone XL Pipeline. #TakeBackEarthDay: Join the students taking action across the country by demanding the Obama Administration reject Keystone XL! Whether it’s your administration on campus or the administration in Washington, we’ve got to hold our leaders accountable to their climate commitments, and push them to make a clean break from big polluters: divesting from fossil fuels and moving to 100% clean energy. That’s what Earth Day needs to be about. Tonight is the end of the State Department’s official comment period for Keystone XL, and this is a critical moment to show them that it’s no longer business as usual. 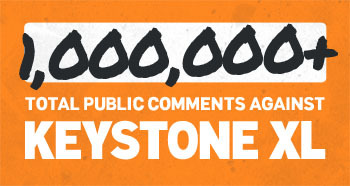 Add your voice to help us reach one million public comments against Keystone XL before tonight’s deadline! Once you send your comment, you can check out all the awesome #TakeBackEarthDay actions going on across the country, and download the brand new Earth Day edition Power Shift All Stars mixtape featuring Grizzly Bear, Sanitigold, Major Lazer and more!